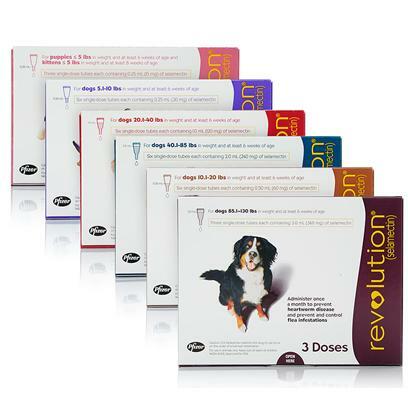 Revolution for dogs and cats is an easy to use, topical treatment that kills fleas, flea eggs, ear mites, scabies and controls dog tick infestations in dogs. In addition, it helps with heartworm control as well as the spread of parasitic worms like roundworm and hookworm. This monthly solution for tick and flea prevention in dogs and cats is FDA-approved and safe to use. Applied to the base of your pet's neck, Revolution is a quick drying, non-greasy medication that seeps into the pet's skin to more efficiently distribute the medicine all across your pet's body. Revolution for dogs and cats is well-tolerated by pets, with less than 1% displaying symptoms. Some exhibited temporary hair loss or skin irritation at the application site. More serious symptoms may include excessive drooling, rapid breathing, lack of coordination, vomiting, or diarrhea; consult with a veterinarian immediately if these appear. Revolution for dogs and cats is for once-monthly (preferably on the same date each month) use either year round, or only during mosquito season. To administer Revolution, part the hair between your pet’s shoulder blades and apply the contents of a tube of the proper dose to the skin. Dosage is dependant on weight; consult with a veterinarian to determine the proper amount.